Golf des Yvelines is situated right in the heart of Île-de-France, just 35 minutes west of Paris and right next to the majestic Chateau de Versailles. The stunning natural surroundings are the first this you will notice upon arriving at this serene golfing complex, which is composed of two golf courses and a magnifice laid out within an area of 90 hectares bordering the forest of Rabouillet. There are two courses at Golf des Yvelines: the 18-hole Chênes and the 9-hole Tilleuls. The main 18-hole course, which measures just less than 7,000 yards from the back tees, was designed by the renowned British golf course architect H.J. Baker in 1990. It is characterised by its unique layout and the height of the imposing trees (some of which are over 100 years old) which define it. The 9-hole track, which measures just less than 2,200 yards, is perfect for learner of the game and the seasoned golfer looking to hone his iron play and short game. As well as the two golf courses, the club also has excellent training and practice facilities, including: a driving range with 20 covered bays, putting green, pitching green and practice bunker. 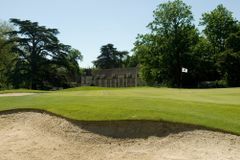 Golf des Yvelines is also able to boast a stunning clubhouse which was once a 17th century Chateau. After a complete restoration it now houses a great restaurant with a terrace.